We re-boarded our group boat about 6:30am for a three-hour journey to the port of Slano about 10 miles north of the town of Dubrovnik. 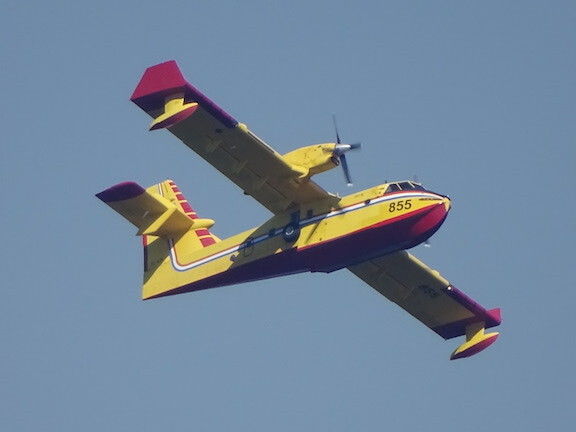 As we approached Slano there were two fire fighting planes swooping into the bay to collect water to assist in putting out a local fire. Due to the warm weather and electrical storms there have been many fires in Croatia. Once on shore Debbie, the cruise director, had arranged for a taxi driver to take us to the clinic in Dubrovnik and then onto a hotel where the rest of our group would be arriving in several days. The private medical clinic was located in an office building very near the cruise port of Dubrovnik. It was very clean, the staff was pleasant and we were seen within 30 minutes of arriving. The doctor took X-rays of Kent’s arm to confirm that he had indeed broken both of the bones in his left forearm. 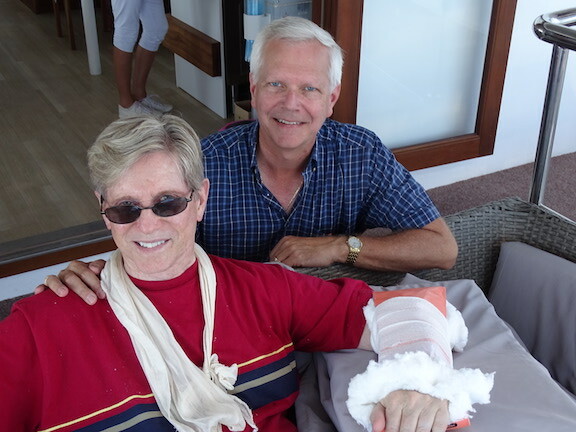 The doctor recommended that he stabilize the arm with a plaster splint acceptable for air travel and that we head back to the US for surgery on his arm as soon as possible. Bummer! The taxi driver then took us to our hotel in Dubrovnik where Mark made calls to reschedule our airline tickets. After thirty minutes on the phone it became clear that it would cost more money to change our airline tickets than it would be to purchase new one-way tickets home. We made arrangements to travel the following from Dubrovnik to Frankfurt, Frankfurt to San Francisco and San Francisco to San Diego. After a late lunch we headed to our room and were in bed early to prepare for a long day of travel the next day.